Security cameras are commonly listed as one of the most effective burglary deterrents. When criminals see cameras on a property, they often decide that they are better off going after another target. The realization of this fact has given rise to a market for fake security cameras. These are units that look like security cameras, but they have no ability to record or transmit video. The idea of deterrents that serve no functional purpose is not new. Some people may hang signs that imply the presence of a security system when they don’t actually have one. A homeowner might choose to hang a “beware of dog” sign when they don’t own a dog. In essence, you are hoping that you can trick criminals into believing that your property is more secure than it really is. With more homeowners and small business owners starting to ask if they can get by with installing fake security cameras, we would like to take a closer look at this idea. The first thing to say about fake CCTV cameras is that they are better than nothing. Some burglars may see the fake cameras, assume they are real and move on to a different target. They may also be effective for preventing petty crimes like package theft. If an inexperienced criminal is approaching your house to lift an unattended package, they might see the fake camera and decide that it is not worth the risk. 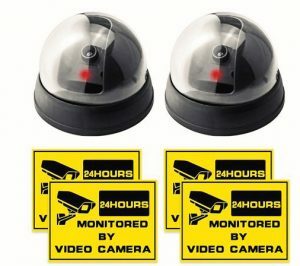 As another point, fake CCTV cameras are cheaper than real cameras. With no need to capture video, these devices don’t need all of the parts that make a real camera work. You also have no need for monitoring equipment, a DVR or any of the other components that go into making a working CCTV system. All told, you could probably outfit your entire home with fake cameras for the cost of one or two functional cameras. Installation is another point. 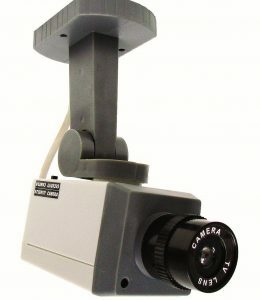 Since a fake camera doesn’t to serve a genuine functional purpose, it is much easier to install and set up. This point used to be a little more relevant when all CCTV cameras had to be hardwired. With modern wireless cameras, it still takes a little more work to get things set up, but the installation is much easier than it used to be. So, there are some positives to fake cameras, but they are not as effective as many people may think. The downsides to installing fake security cameras are significant and they need to be considered before making a decision. While it is true that fake cameras can have some effect as a deterrent, they are not as good as real cameras in this regard. A fake CCTV camera is only likely to work on an inexperienced criminal. A professional burglar is going to be able to tell the difference, and once they know that it is not recording, the device will no longer act as a deterrent. One of the first signs of a fake camera is the material. A real outdoor security camera is going to be made from durable, weatherproof material. Fake cameras are usually made from cheap plastic. When a burglar spots the telltale signs of a fake camera, it is likely to have the opposite effect of a deterrent. Many burglars will assume that you have no serious security measures, and as a result, they will be even more confident. As a business owner, fake cameras could actually expose you to the risk of a lawsuit. If a customer or employee assumes the cameras are real, and then they are the victim of a crime, they could claim that the fake cameras provided a false sense of security. In other words, they are going to claim that they would have done more to protect their own security if they did not have the false impression that you had real cameras watching the property. The presence of cameras will have a deterrent effect on most criminals. However, there are some criminals who are so bold that they will commit a crime even if they believe they are being recorded. With a criminal like this, even the deterrent effect of a fake camera will have no value. When real cameras fail to act as a deterrent, they can at least provide valuable evidence to help catch criminals after the fact. With many home burglaries, there are no leads for the police to act on. They will investigate the crime the best they can, but without any evidence to point them in the right direction, there is a good chance the crime will go unsolved. With real cameras on the premises, you can provide the police with vital leads that can make a significant difference in their attempts to track the perpetrators down. Real security cameras come with some obvious advantages that you would not get with dummy cameras. As I mentioned above, real cameras actually record video and they can be used to provide evidence in the event of a crime. Additionally, they can act as a deterrent to even the most experienced criminals; when they identify the fact that it is a real camera, they will know that you are serious about your security. For most people, those two points will be enough to convince them of the value of installing real cameras over fakes. However, modern security cameras come with a range of benefits that you might not even realize. Today’s wireless security cameras can integrate in with your security system or connect to the internet to open up a wide range of useful features. With cameras that are connected to a smart security system, you can keep an eye on your home no matter where you are. Most new camera systems have apps that allow you to monitor your cameras from a smartphone, tablet or from a laptop. That means you can check on your home any time you feel the need . Beyond just being able to monitor video streams on your phone, many of these systems can be set up to send you alerts. Cameras can be equipped with motion detectors that start recording when something enters their field. It can then be programmed to send you an alert to let you know it is recording. If you see suspicious activity, you can then contact the police or call a friend, neighbor or family member to check on the property. 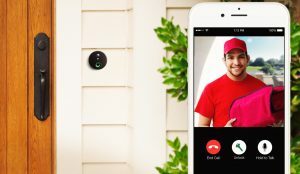 You can now buy cameras that connect in with smart security systems and home automation platforms. With a system like this, you can program the cameras to work with a wide array of devices to improve the security in your home. As an example, they can work with devices like smart lights to provide an additional deterrent. With smart lights and the smart camera, you could program the porch light to come on when a camera near the front door is triggered. But it doesn’t even need to be about crime. With devices like doorbell cameras and smart locks installed, you could provide access to guests when you are away from home. Let’s say a trusted friend needs to enter the home when you are at work. They could ring the doorbell and you could then use the video and the two-way audio to verify their identity. Once you know it is a person you trust, you could then use the app on your phone to unlock the door and disarm the security system. Whether you are talking about a home or a business, security is important. While fake cameras will have some deterrent effect, they also leave you unprotected in a number of ways. If you want to ensure the security of your home or business, you don’t want to leave it up to fake devices that don’t really do anything. If you are interested in the protection that comes with real security cameras, contact the team from Cornerstone Protection. Our security experts can help you design a smart security and CCTV system that will provide the highest levels of security for your home or business.